Is the bond bull market really over? Market analysts continue to talk about the end of the bull market for bonds. But, does this ring true? As we enter the final quarter of 2018, bond and equity markets have become more volatile. There has been continued focus on the US and the policy initiatives of the current President. In particular, the threat of tariffs and the effect of what could be late cycle stimulus from US Tax cuts. US economic data has been strong. This supports the Federal Reserve’s moves to normalise rates and execute their policy of regular and steady rate increases. The market is well aware of what the Fed is thinking and planning. This generally means that the financial market, including the equity market, have already factored in the impact of these proposed rate increases. Market analysts continue to talk about the end of the bull market for bonds. But, does this ring true? So far this year, the Bloomberg AusBond Credit Index (Corporate Bond Index) is up 2.51%. The S&P/ASX Accumulation Index over the same period is down 0.42%. So far this year, the yield of the 10-year Australian government bond has only increased by 6bps from 2.63% to 2.69%. The US 10-year government bond over the same period has increased by 0.75% to 3.16%, after recently touching a high of approximately 3.25%. This shows that the Federal Reserve’s monetary strategy is not always correlated with the RBA’s. 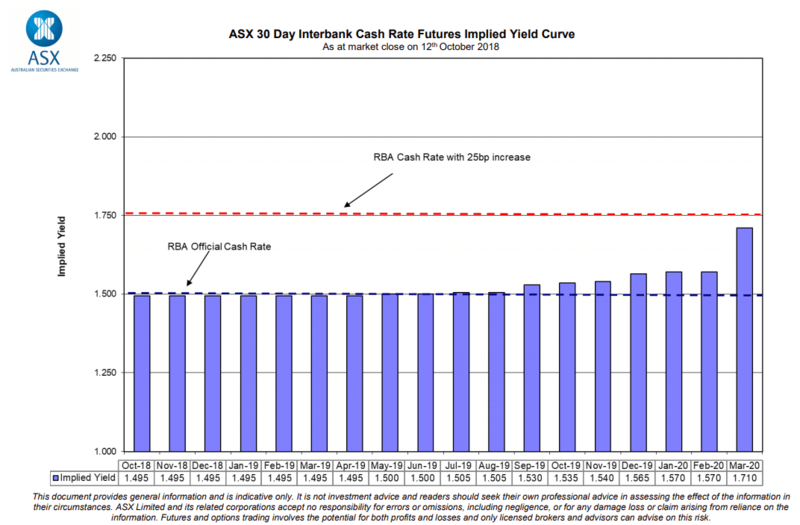 The current RBA Interbank Cash Rate futures show that the market still isn’t pricing in a full rate rise until after March 2020. In March 2020 they are pricing in an 84% chance of a rate rise. Interestingly, in February 2020, the month prior, the market is only pricing in a 28% chance of a rate rise. This is despite expectations of another Fed move in December and 2 or possibly 3 moves in 2019 priced in. What’s been happening at XTB? Both our product range and FUM continue to grow steadily. We are now sitting at around $325m FUM in just over 3 years. Last month we issued 5 new XTBs, including 1 new issuer – Vicinity Centres Trust. The Yield to Maturity for YTMVC1 is just under 4%, at 3.9%. We also have some XTBs trading close to their face value of $100. We have also seen a few of the XTBs we launched in 2015 and 2016 mature. Over the last quarter 4 XTBs matured and November will see another 4 maturing. We’ve been very pleased to see many investors reinvesting in a new XTB following maturity. Please get in touch if you are looking for replacement XTBs for your clients, or want any further information on how the maturity process works. XTB portfolios and SMAs continue to outperform other fixed income listed (and unlisted) investments. Concentrated High Yield: 4.92% p.a. Maturity Ladder (S2): 4.92% p.a. Cash Plus (floating-rate notes): 2.90% p.a. Most of the XTB portfolios were created on or before, 30 August 2016. They aim to help advisers create portfolios to meet differing client needs. The chart above looks at performance of our Concentrated High Yield portfolio vs some of the most popular fixed income funds and ETFs. When selecting XTBs or a bond fund/ETF the key benchmark to consider is the expected yield to maturity after fees. Yield to maturity is a forward-looking number. It indicates what you are expected to earn if you hold to maturity (assuming no default). It’s important to remember with bond funds or ETFs that you never precisely know as they don’t mature – they are perpetual. Another important consideration is that the YTM of a fund or ETF is shown before fees. You’ll need to think about deducting their fee to get closer to their ‘real’ yield to maturity. With XTBs the YTM you see incorporates the fee, so what you see with XTBs is what you get. Please call me on 1800 995 993, to discuss what portfolios could work for you and your clients. I can create a personalised cash flow PDF for you to discuss with your clients at your next review meeting. The performance chart above is for illustrative purposes only; it does not constitute investment advice and is based on data from sources believed to be reliable. This chart is only made available to professional investors within the meaning of section 9 of the Corporations Act, it should not be provided to any person who is considered a retail investor within the meaning of section 761G of the Corporations Act. This chart is based on certain assumptions, as set out below. We use Bloomberg Cumulative Total Returns (Gross Dividends) for all non-XTB funds. The theoretical XTB Concentrated High Yield portfolio uses the original constituents from the portfolio start date on 30 August 2016, all data, including for the period prior to the XTB Concentrated High Yield portfolio start date, is sourced from Bloomberg using the Underlying Bond prices, plus the securities manager’s margin (fees). As such, it may not represent transactions that are capable of execution at any particular point in time. All other data is sourced from Bloomberg, using the published unit price (after fees).